I’m a long time patio cook from California having used charcoal and gas grills plus an electric smoker for years. But I was never satisfied I was really able to create “top of the line” results with these. 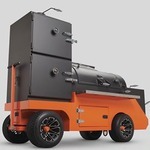 I also used pellet grills at the business I managed for customer and employee events but they were of another brand, functioned poorly and I never felt I could control them, particularly to get added heat. So I looked at the YS 640 a year ago, saved my nickels, dimes and quarters and became an owner yesterday. Set-up was great due to perfect instructions, first burn went fine and now I am ready to launch! Now I am feeling a bit intimidated at changing all my cook routines for things I have cooked for years and can do in my sleep. But I am confident that after some experimentation I will have a whole new stable of “go-to” dishes perfected on the Yoder. My wife and I are into healthier, less rich protein items but still love BBQ and grill. Any suggestions for locations of pellet grill recipes along this line? I think the moderators would prefer to not advertise for other sites. In today's day and age its pretty simple. Whether on this site or just google by typing in the protein you are cooking as well as a few added words you can find more than what you want. Yoder chicken, Yoder ribs etc. There also is a section below that shows many as well as just asking on this site for a good one. I personally keep a log for all my favorites but should also ad that many have a favorite author or cook that they adhere to ie Steven Raichlen or many of the others. Either way half the fun is finding one, adding to it, or just getting some ideas. Wish you well and the journey has just begun!